Ready for delivery. Tyler and his coffee dispenser for St. Johns Coffee Roasters. My boyfriend Tyler Adams is one of the most resourceful people I know. Some of the incredible things that he's made (fabricated and built from the ground up) during the 10 years we've been together include a top loading glass kiln, countless tattoo machines, a backyard kiwi arbor and all sorts of other garden structures, loads of motorcycle parts (some really complicated ones too), a welded metal interlocking security system for a Land Rover (friends who are now traveling in South America), and the coffee bean dispenser above that Tyler made for Mount Burns and Julie Gebron of St. Johns Coffee Roasters. Tyler spent months on this one and it shows. Tyler's coffee dispenser's new home at St. Johns Coffee Roasters! Tyler and Mount messing with the lever. 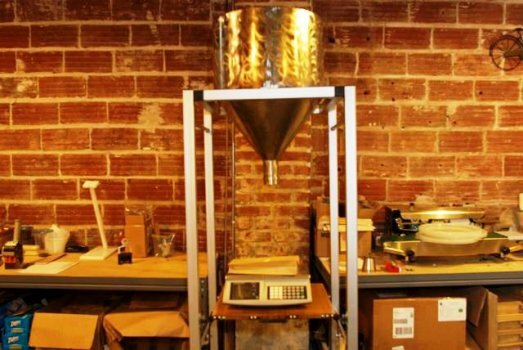 I can't tell you all the ins and outs of the dispenser design but if you vaguely remember a guy with a notebook, scribbling things and making sketches while examining your local market bulk coffee dispenser during the past few months that was probably Tyler. All of this R&D paid off because the dispenser is now in full swing and saving Mount and Julie a lot of time. If you have any interest in Tyler's coffee dispenser (it's a one-off for now but he might make more in the future) drop him a line at tyler at grizzlytattoo dot com or stop by his new tattoo shop after June 1st -- Grizzly Tattoo on North Williams -- and ask him about it. No other local coffee company sources solely farm-direct AND family-direct coffee. Augusto Carvalho Dias Carneiro co-owner of Nossa Familia Coffee -- which was founded in 2006 and is the only family-traded coffee in Portland -- grew up in Rio de Janeiro but spent holidays on his family's farm eight hours west of Brazil's capital. According to Augusto that's where most of his childhood memories are. Some of the fondest include early morning horseback rides with his grandpa and his grandpa's friends through the coffee fields. These days Augusto who's lived in Portland since 1996 still likes to ride around his family's sixth generation Brazilian farm. He just has different transportation now -- his bicycle. Augusto is a cycle enthusiast and has made a couple trips to the farm with fellow mountain biking friends. (The last time I saw Augusto he was setting up a coffee booth at a cycle event at the Washington County Fairplex in Hillsboro the same weekend as the Home Orchard Society's All About Fruit Show.) Of course anytime Augusto returns home now -- usually once or twice a year -- there's plenty of work to be done. Although Nossa doesn't roast its own bean (another Portland roasting company roasts for them) Augusto hopes to in the near future. Nossa currently imports about five percent of the farm's Brazilian coffee -- about 80,000 pounds a year -- so there's plenty of room for growth in more ways than one. In the summer of 2009 Nossa Familia opened a café at the non-profit Ethos Music Center on North Killingsworth that serves Nossa Familia Coffee, tea and snacks. In addition to the café you can find Nossa Familia Coffee at all New Seasons Markets, People's Food Co-op, Food Front Cooperative Grocery, the Hollywood and Lents Farmers Markets and other locations around town. Go to Stumptown's Leftbank event this Thursday, October 8th at 6:30pm if you want to know more about where coffee comes from. Stumptown Coffee Roasters is hosting international growers and exporters from Columbia, Kenya, El Salvador and Costa Rica for a public panel discussion about everything from sustainable farming vs. conventional production to innovations in trade channels. There's a coffee tasting that precedes the event in the Leftbank lobby at 6pm and the panel discussion begins at 6:30pm. If you're hungry or thirsty for something more than coffee you can also sample food and drink from Upright Brewing Company and Leftbank Cafe while there. I don't think I'll be able to make it but I hope a lot of folks turn out. It's pretty incredible that Stumptown is hosting such an event for its growers, exporters and for Portland. I have a lot of love for this. Andrea Spella is holding my key to happiness -- a Spella Caffe cappuccino. There are a lot of great Portland food and drink carts and Spella Caffé, open since fall of 2006, is one of the best. The reason: Andrea Spella. Andrea is part Italian and part Polish and drinks about 10 to 15 shots of espresso a day. He claims it helps him sleep and adds with a smile, "I guess I'm just wired differently." I guess so. In the past few weeks I've been so nervous about my impending book due date that I've sadly had to cut out my afternoon cup of coffee. In the past couple years I've looked forward to my afternoon cup almost as much as my morning cup but when your heart is aflutter with nerves too much coffee just adds to the stress. Anyway, 10-to-15-shots-a-day Andrea obviously doesn't feel my pain. I met with him in late April and learned all about why he loves coffee and why we Portlanders love his coffee. Spella Caffe's signature classic Italian roast coffee is roasted in small 11 pound batches and pulled ristretto style with an old school piston machine as opposed to a modern pressurized pump espresso machine. There's no walking away from the machine or even talking much with customers while a Spella espresso is in full swing. The end result is a nicely extracted cup of coffee with a beautiful crema. In addition to expertly prepared coffee the cart serves from-scratch chai, hand shaken iced drinks (Andrea doesn't like blenders), small batch Stella Gelato made in Eugene, and all sorts of tasty baked goods -- authentic biscotti, quickbreads and cookies -- prepared by a loyal customer and librarian at downtown's Central Library. Over the years Spella Caffe has acquired quite a following so it's rare to step up to the window without at least a short wait. Two of Andrea's favorite regulars are Little Red Bike Café owners Evan Dohrmann and Ali Jepson who rode their tandem bike to the cart for a celebratory shot of espresso minutes after they were married (for the third time) at the Multnomah County Circuit Court in 2008. 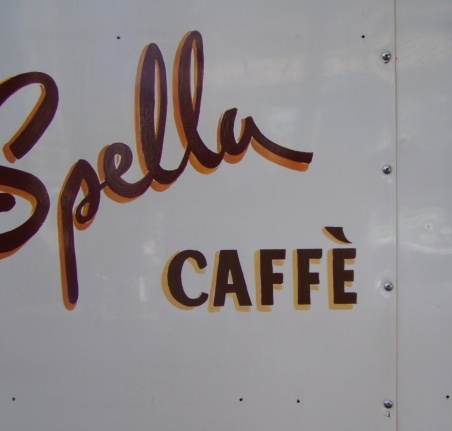 Spella Cafe 901 SW Alder St. 503.421.9723 www.spellacaffe.com Mon.-Fri. 9am-4pm. Stumptown holds free public coffee cuppings at the Portland Annex every day at 11am and 3pm and at the Seattle 12th Avenue location every day at 3pm. In late spring I got to hang out with Stumptown head of operations Matt Lounsbury at the Stumptown house behind the original Southeast Division cafe. Lounsbury started at Stumptown in 2003 as a barista at the Downtown cafe. It was a hot afternoon and Lounsbury's dog Mabel lay on the floor between us as we cracked open a couple beers and talked bean and recent Stumptown developments such as its popular Meet the Producers events. Stumptown regularly helps the growers it works with travel to Portland, Seattle and soon to New York (their cafe in the lobby of the Ace Hotel in Manhattan is due to open any day and the roastery in Brooklyn is already up and running) so that they can hold open to the public informational events, slide shows and tastings. According to Lounsbury it's often very emotional for these growers to see their coffee labeled with the name of their farm and town in cafes and shops. It's usually a first. While I met with Lounsbury Stumptown's green coffee buyer Aleco Chigounis was busy getting all his beans in a row at the cupping laboratory next door before setting off to Rwanda for two weeks, a week in Columbia and a few days in Ecuador. An average year for Chigounis entails seven months of travel time visiting Stumptown Coffee growers and potential growers around the world. Chigounis follows a strict regimen that involves checking on the ripeness of the beans at harvest, inspecting the washing stations, making sure the coffee is kept separated by harvest day and more. If Chigounis has his way Stumptown will completely walk away from Fair Trade with 100% direct trade coffee in the near future. The hardest nuts to crack in terms of farm direct are Africa and Indonesia. This summer Stumptown welcomed its first farm direct Indonesian coffee. I took this photo several years ago at the Division Street roastery. A week ago I visited Portland Roasting Coffee Company in Southeast Portland and talked with owner Mark Stell and national sales director Marie Franklin. 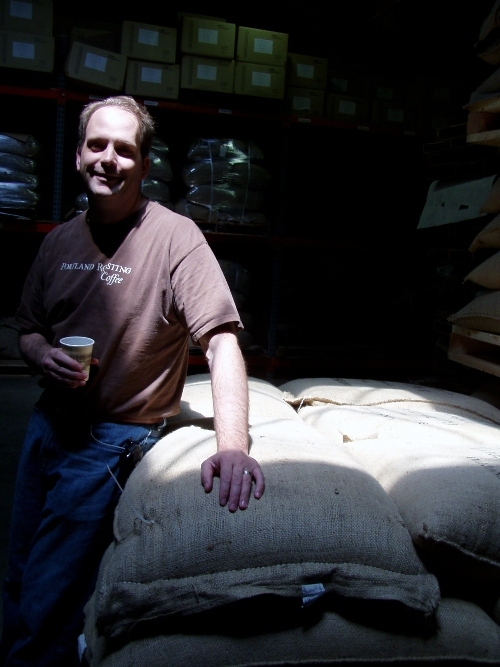 The almost 14 year old coffee company is one of Portland's first direct trade roasters. On average PRC pays coffee growers 30 percent more than Fair Trade. I learned about the history of the business and current goings-on while drinking a Clover brewed, lightly roasted cup of their tasty morning blend in the cupping room. I also got a tour of the 18,000 square foot space which used to be a popcorn roasting facility. Stell owns a coffee farm in Tanzania, situated right next to Ngorogoro Conservation Area, with his two brothers and a Tanzanian partner. The farm is 1,000 acres total but only 160 acres are devoted to coffee. The last couple years the farm has produced two shipping containers worth of coffee per harvest that's been used exclusively for PRC's Tanzania brew. In the future as the farm produces more they'll distribute excess to other roasters. When Stell and his brothers bought the farm two and a half years ago it employed 12 farm workers, PRC now has 70 full-time Tanzanian employees on payroll. If you want to participate in a free Portland Roasting Coffee Company tasting (afternoons Monday through Friday) call the office at least 24 hours in advance. Tastings can usually accommodate up to 10 people and last about an hour. 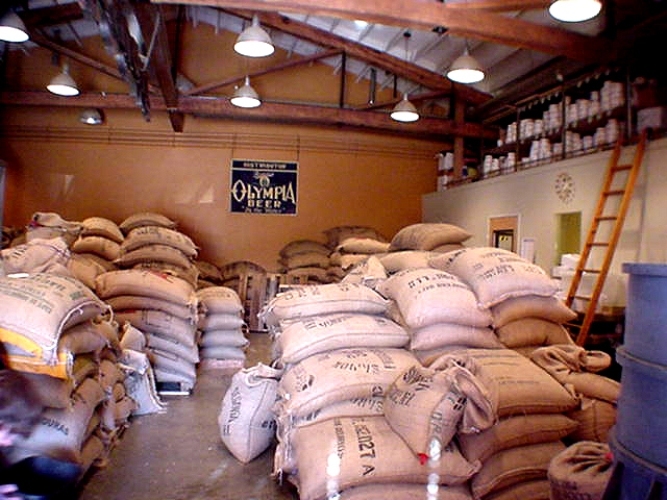 Portland Roasting Coffee Company regularly roasts small samples of beans from farms from around the world. Several times a week employees participate in cuppings that are often open to the public. Mark Stell visits the Tanzanian coffee farm three times a year. The elephants are not on payroll. I recently met up with Courier Coffee owner Joel Domreis and employee Alex Geddes at their small backyard roastery and talked coffee, and of course drank coffee, for a couple hours. Alex had roasted some Bolivian Cenaproc Cooperative coffee that morning and he brewed us a pot in one of their new Hario vacuum pots. This was my first experience with siphon brewed/vacuum pot brewed coffee, even though I've heard a lot about it, and it was delicious and really fun to watch. The standout for me was that there was no silty residue in the cup and the coffee was hyper full of flavor. I don't think I'd ever own a vacuum pot though. I have a hard enough time not breaking the glass in my French press. These are works of art. 28 year old Domreis started his bike delivered Courier Coffee three and a half years ago and for a year and a half he ran the show. Now he has one full-time (Alex Geddes) and one part-time (Matt Sperry) employee to roast beans with and peddle around town with. A typical day for these guys starts at 4am and ends after the sun has set and all the coffee for the next day has been roasted. Deliveries are made from as far southeast as Southeast 92nd and Johnson Creek Blvd. to as far north as St. Johns. And even though Courier only has about 30 accounts (coffeeshops, restaurants, bars and offices) they deliver daily to many of them in order to ensure super fresh, super tasty bean. Some of their most valued clients include Half & Half, Little Red Bike Cafe, Sel Gris, Olea, Two Tarts Bakery, Eastmoreland Market & Kitchen and Dove Vivi. Domreis talked me through their roasting process, showed me their burlap sack stacked coffee storage area and discussed the merits of slow growth in particular to his business. Understandable since every new account adds many miles literally and figuratively to their work week. That's not the only reason Domreis is reticent. Courier has a certain ethic and culture that clients need to jive with. If you don't want to discuss things like first and second crack, or if you want all your coffee ground and delivered a couple times a month Courier doesn't want you. You can buy bags of Courier Coffee beans at Half & Half, Little Red Bike Cafe, Eastmoreland Market & Kitchen and Two Tarts. You can also have Courier Coffee delivered to your door step or pick it up at the roastery -- just call ahead first.